Reference to this print is found in John Farington's Diary. 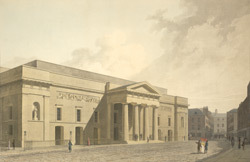 On Tues 5 September 1809, he records William Daniell calling and showing him "an impression of a plate He has executed 'Covent Garden Theatre' - tinted, price, one guinea." The reaction of his audience to this print was unfortunately not favourable. Farington notes that when Lysons and Lawrence viewed the print: "they expressed their disappobation of it, in the strongest manner, as not giving any idea of the dignity of the building, the point of the sight chosen too high, the street too wide- & half the paper sky. Lawrence went to W. Daniell to recommend to Him to execute another plate."